April 25th 7.8 magnitude Nepal earthquake affects me, my family and friends – ArunasNepalRelief, Inc. I get a message on my phone from Denmark its my best friend’s sister. Message reads “Dear Ru, very sad to hear about the tragedy that’s overcome Nepal. Hope your family and and friends are not injured or have suffered losses in anyway! Best of thoughts and wishes.” I find out the devastating news. She feels bad she broke the horrible news to me, but I am grateful and I immediately start making calls to my US Nepali friends and everyone else possible to find out if my mom survived! Its a horrible horrible feeling. I Try to call my mom on Landline and Mobile, nothing. Start calling friends in US. Then I Post on FB still trying to find my mom, any news let me know please. FB starts to light up with updates, I see friends in messenger slowly and I reach out to them to see if their family is ok and they are ok, those living in Kathmandu, Nepal. Then I start reaching out to my Luther college Nepali friends now living in Kathmandu, frantic, desperate just to hear mom is ok. I give her mobile number and home address, and wait patiently. Thank fully I find out from a dear Luther college friend my mom is safe. Thank you Bhaskar! I am relieved a little but still need to hear her voice. That evening our dear neighbors Hank and Genette very kindly insistently bring us dinner so we don’t have to worry. They sit and talk to us and are very comforting throughout. Always have been, pre earthquake too. Thank you, you mean a lot to us. Always there during good times and bad! Early this morning for the first time I got to hear my mother’s voice since the 7.8 magnitude Earthquake hit Kathmandu, Nepal on April 25th. Tremors continue, aftershock today 6.7 magnitude was reported. Was very brief but I heard her. The death toll is 2,400 and counting and injuries and destruction massive and still continues with tremors on and off. I am personally feeling helpless and very restless, worried when the next call will come to let me know my mother is safe. I worry about all those have perished and all those injured and all their immediate needs right now. This is my family, this is the country, this is where I was born and raised and I want to help everyone affected in Nepal in any small way I can. I know I can’t help them all but I also know I have to do something! My friends living in the US who are from Nepal are all coming together and collaborating in their own way and doing what we can, which is very little, but we are trying our best! Talked to my mom on and off for 3 to 5 min at a time, mostly call drop. I hear she has fever and dysentery after living in the tent camps, but because the line gets cut off can’t find out full details I panic more. But can’t get in touch with her to verify in detail. April 26th to 29th I am awake each night since I cannot sleep first and second, its the best time to catch friends in Nepal on FB messenger due to the time change, I am worried sick! Trying to get updates, keeping phone lines open so someone may call me or msg me. People probably think I am nuts by now as I try to reach anyone and everyone on Messenger and FB but I stopped caring, just searching for answers. I reach out to my Luther college friends living in Nepal. Luther friend Anita and high school friend Soni come to my aid. They call her on her mobile and find out she is better. That is all I needed to hear! Thank you! I start fundraising by myself on my tennis website and start pledging to people who know me well: This helps me cope by staying busy and to focus on the people of Nepal. Very little I can do from here in the US but I do what I can to collect donations, ensuring all that money will reach directly to people who need it most! In the back of my mind I keep thinking I will go now, no next week, I need to be there. I am told by some of my friends at ground zero basic needs: food, medicine, rubbing alcohol,water purifiers, antiseptics, blankets, bottled water, chlorine tablets, non-perishable food items, sanitary supplies (including sanitary pads), torches, surgical gloves, masks, batteries, swabs… basic medic needs are essential first before the next phase of epidemic should be feared! People start reaching out and donating and emailing me immediately. Mostly people who’ve known me for a long time including tennis student parents, friends in the tennis industry, IA, SC, TX. I feel energized to the point I cannot sleep thinking of ways I can help! This morning, April 27th, 2015, I setup a separate account through Bank of America dedicated solely to Earthquake Nepal 2015 funds. April 30th, 2015: First Time I get to talk to mom for 15 full minutes on LAN line. I find out she is better and she sounds good. She has gone back to her apt. fearing for illness at her tent camp since she was just recovering from chest congestions few weeks before the earthquake and had just come back from treatment in New Delhi. But she is one of the fortunate ones that has her apt intact and now has food and water (which she boils twice) and a clean place to sleep and restroom. She is still alone but has apt friends slowly moving in next door. I am lucky and so is she and we feel blessed. I can finally sleep and focus a little more here at home and my work and fund raising! It’s a big relief but not for all that lost lives and loved ones and without a home today. Now I am going full force. April 30th to May 6th, 2015 : I becomes We! Austinite friends reach out to me, I reach out to them. A Texas Non Profit corporation ArunasNepalRelief, INC is formed : A dear friend who is also a business lawyer reaches out to me and donates her services to form a Texas Non Profit corporation. I reach out to get 2 other members on the board, Rich and Cheri. We meet, we discuss and they are on board! I reach out to another dear friend from my web graphics professional background and Jeff offers his web services as a donation. The pieces fall in place and “I” becomes “We” the initial concept turns into a collective effort. I am very touched by all the hands reaching out to help me. When you start something sincerely and take initiative hands on, people start to take notice and they join hands and it becomes a collective effort. We are now ArunasNepalRelief, INC Texas Non Profit corporation! We just got started but we are here to go the long haul to help Nepal Relief efforts! Thank you! May 6th onwards: Our goal is to get the website setup quickly as some of our members get ready to fly to Nepal. We want our donors to see where their money will go directly and how relief supplies and funds get distributed. Our plan is to post photos and videos for transparency as we appreciate the generousity of our donors and we have a responsibility to them! Thank you! 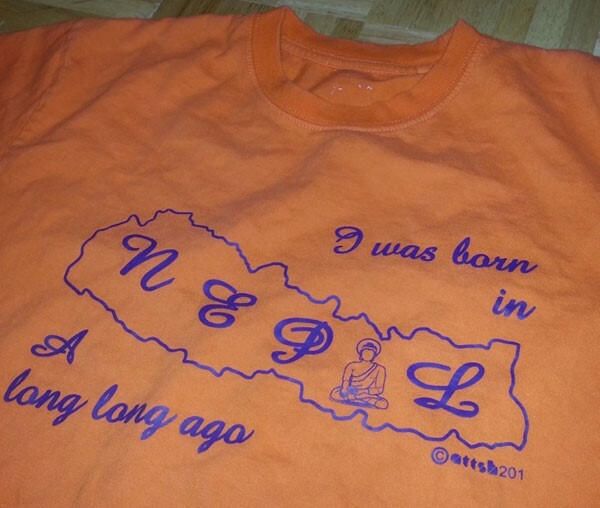 “I have a Tshirt my mom sent me from Nepal that says “I was born in Nepal a long long ago”. It is true! Yes, I was born and raised in Kathmandu, Nepal quite a long long time ago. I grew up in this beautiful country, watching parts the Himalayan mountains everyday, from my 2 1/2 story house where I lived with my family. I grew up trekking, hiking, visiting the rural area villages and temple sites, and loved living in Kathmandu the capital city. My parents are both Nepali and they raised me with a lot of love and support and made me everything I am today. I was very fortunate to travel worldwide with my family and thus after a few visits to the US I chose to come here for my education. They finally gave in and sent me to the US to study at Luther College, IA, which is not an easy thing to do emotionally and financially for people living in Nepal but my parents made it happen for me, through their hard work, like many of my other friends in the US. This is where I met some of my closest friends who have been there for me to this day. Some of them have moved back from the US to Nepal. When the earthquake hit, they came to my aid from Nepal, as I was frantically trying to find out if she was ok. Despite what they themselves had just been through and are still going through, they were still willing to help me find out about my mom. I am so thank full to them! Nepali people are very hardworking, honest, kind people who will do everything they can to give their children the best education even if they have to start from scratch and make their way up to better their lives and their families lives. I have lived in the US for 25 years now, am a US citizen and now a true Austinite living in TX for 16 years. Austin, TX reminds me a little of Nepal with its beautiful lakes and hills and scenic beauty, and kind people. Then I went to SC to VDM Tennis Academy and lived there few years got married and moved to Austin, TX. We have an amazing son. Every time I went home from college I told my parents to send me to the villages. The camping sites are amazing. I’ve always loved the outdoors thus I love it here so much we decided to stay! The wildflowers here is an amazing site. I always say I have the best of both worlds, since I do have two countries I call home and love them both. Web design and tennis are my two passions but I have many more. Causes I have donated and been involved in mostly here in the US through my years living here: Cancer, MS, Austin Animal Center (fostered 11 kittens, 2 nursing kittens and mama, got them adopted, adopted 5 dogs and 1 cat total ourselves), Project Nepal orphans, Animal Nepal, Tony Hawk Foundation, Andy Roddick foundation, Davis Elementary, Unicef, Laurel Mountain Auction fundraiser, Austin Childrens choir, Davis Disco silent auction, CHOC Walk in the park, Castleman’s disease, NFCC International – Fight Against Gender Discrimination in Nepal, donated 2 big hand painted murals to Davis Elementary school, Austin, TX, which I enjoyed creating and took 4 weeks to complete. All causes I have loved being part of! Aftere 9/11/2001 nothing has struck me so hard so close to home that has completely been devastating. The 2015 Nepal earthquake victims is now my main focus and I am going there myself to help any small way I can. Thank you all for your kind donations and relief supplies that has made my ArunasNepalRelief, Inc. team’s immediate goal of directly going there and reaching out and distributing funds and supplies, possible! We will finalize our long term goal once we get there! April 25th, 2015 Nepal earthquake hit straight to the heart again! 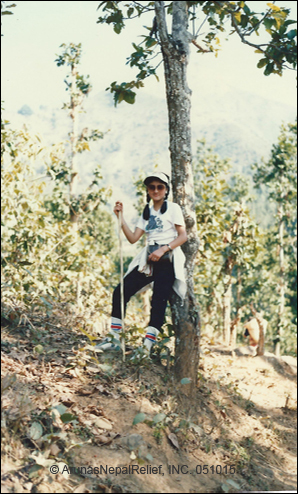 This was taken in Nepal when I was 15yrs. old, on our family trip trekking up to Manakamana temple. It took us 4 or 5 hours back then to get up there but one the the best memories with family and friends! May 12, 2015. Another 7.3 magnitude earthquake hits Nepal again!